Almost all of my alcoholic beveraging is beer these days, but I do have a soft spot for a few distilled spirits, especially single malt whiskies. My involvement peaked a few years ago when my neighbor Dave and I got into an Islay arms race at about the same time we fell in with a poker and Scotch group that included some prodigious collectors who were very generous with their whisky hoard. Below is a picture of the buffet at my house one night -- the collection was often twice as large if we were playing at the chief instigator's house. Hanging with a crowd like that, I got to try a range of bottlings much broader than any bar would ever stock. But in the quest for novelty you sometimes end up with a pricey bottle of something that sounded special but that doesn't really suit you that well. So I was definitely intrigued when I got an email from British spirits retailer Master of Malt, touting their Drinks by the Dram program, where you can order 3 cl samples of many of the whiskies they sell, for prices mostly in the range of $3.50 to $8.50 (at today's relatively favorable exchange rate of £1 = $1.56) all the way up to $122 for a rare 1952 Glenfarclas. 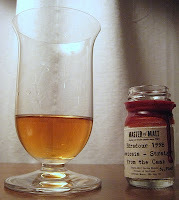 Now, I'm not likely to go for that 1952, but in a moment of weakness I might part with $28 for a taste of the Glenfarclas 1966 -- distilled the year I was born. The real usefulness of Drinks by the Dram is to get a reasonably-priced sample of something you might want to buy a whole bottle of -- for example, plunking down $7 on a 19 year old Laphroaig bottled by Signatory before taking a $95 chance on a full bottle. Master of Malt recently sent me 5 free samples from Drinks by the Dram. The samples were packaged in little screw-top vials that are then sealed with red wax. If 3 cl doesn't mean anything to you, consider that bars usually pour you a 4 cl dram of whisky or brandy, and airplane/minibar liquor bottles are 5 cl. The picture at left shows one of the samples poured into a Reidel single-malt glass: slightly smaller than what I'd normally pour myself from the bottle, but enough to get a good idea of the taste. The prices of the samples ranged from $5.43 for MM's 12 year old Islay from an anonymous distillery (Bruichladdich is my guess) to $13.31 for Johnnie Walker Blue, but if you're ordering from the U.S. -- or anywhere outside the EU -- request a VAT (value added tax) refund in the delivery instructions when you place your order. VAT is 20% right now, so your refund is effectively a 16% discount on the list price. For example, a dram listed at $6 will get you a $1 refund. The total cost for my shipment would have been $34.08 ($40.56 before the VAT rebate), plus $15.68 for shipping to the U.S., which should take a week or so. It's a little pricey per ounce, but a very economical way to try some hard-to-find stuff. Consider that bars here in Portland would charge you $8-$12 for a dram of Scotch, and the total cost for the Drinks by the Dram pencils out to be about the same or maybe less, especially if you are tipping correctly. You'd get a little more whisky at the bar, but your selection would be much smaller. It's especially nice that the more expensive the bottle, the more reasonably priced the sample is as a percentage of the cost. For example, the Johnnie Walker sample at $13.31 is about 6% of the $209 price of a 70cl bottle, but the house-bottled Islay sample was almost 10% of the price of a full bottle ($56.71). OK, enough about the pounds and pence, I'll tell you about the whiskies I got to try as part of this deal. Dave is at least as big a whisky hound as I am, so he came over and tried them with me. Neither of us had tried any of them before, so chalk one up for novelty. Johnnie Walker Blue - Blended whisky is so far off my radar that I didn't even know there was a Blue label JW. Apparently it's the top of the line, and it showed. It was impressively smooth, with just a hint of smoke in the finish. Quoth Dave: "I could drink gallons and gallons no problem". Tyrconnel 10 y.o. Sherry Cask - Irish single malts are also a new concept for me. This one had a nice caramelly sherry palate, followed by an aromatic finish that had me thinking "hairspray", though not in a totally disagreeable way. Worth a try if Irish whiskies are your thing. Master of Malt 12 y.o. Islay - Intense smoke over a full malt body, followed by a light touch of iodine. Like one of the smoky Bruichladdich bottlings. I love this style of whisky, but $56 plus shipping for a 700ml bottle isn't a great deal for US buyers. Edradour 10 y.o. cask strength - Hot, woody, and dusty. A little bit of a wine flavor. Tastes a lot like a 25- or 30-y.o. (i.e., too long in the barrel). Not my thing, but if you like that dusty flavor of a long time in the barrel, it might be for you. Zuidam 5 y.o. Rye Whisky - From a Dutch distiller better known for his traditional gins (genevers). This whisky is smooth, understated, quite dry. The fruity rye flavor takes a while to hit you. Dave says it's like sucking on a honeycomb -- not sweet, but dries your tongue out like that. If you're a rye whiskey person and want something a little mellow, it might be for you. Anyway, Drinks by the Dram is an interesting service. As I said, I'm not the whisky man I used to be, but I can definitely imagine myself ordering a few samples to satisfy my curiosity about a given distiller or bottler, or to try something special I wouldn't otherwise be able to afford. Wow Bill! This is a great article! Can I come over for poker night??!!! Doc, I think you might be teasing me, but I will invite you next time I host a poker and Scotch night. It's been awhile, but maybe it's time to fire it back up. I'm in. Whattaya play for, nickels? Incidentally, I'm a little younger than you, which is really gratifying. Like Doc, I'm into the Scotches, and would love to try a few more. Still, though this is a relative value, it may not be in my price range. A bottle a year, that's how I roll. FWIW, the single-malt Irish malts can really soar. I had a chance to try the Tyrconnell at a tasting with Stuart Ramsay. Even more interesting was Connemara, a peated malt in the Islay vein. Jeff: I'll keep an eye out for Connemara, sounds like I might like it. Or maybe I'll order a sample of that. If the poker thing happens, I'll drop you a line. Don't hold your breath, we haven't been doing these very regularly. Do I need to have a blog to get in on that poker game?